In the bricklaying trade there is something that masons call "clinkers" —bricks that have been so scorched or misshapen in the firing process that they cannot be placed into a smooth surface without standing out. Thus they are used for precisely that —to stand out as ornaments, placed at irregular intervals in a wall, jutting out and lending little bits of interesting grotesqueness to an otherwise plain bit of masonry. Much of northern Sardinia looks like ornamental clinkers from the Cosmic Kiln. Stone is the obvious building material of choice here, from the original prehistoric proto-Sardinians of 4,000 years ago with their gigantic stone tombs all the way to the builders of chic modern tourist villages wrought in hewn stone and then decorated with outlandishly shaped odds and ends chosen almost at random from the landscape; they are set up as garden gnomes (photo, left) or secondary pillars to help support a building, or placed simply to stick out and look weird. There is such juxtaposition of smoothness and gingerbread-house irregularity here that you would not be out of place asking 20th century masters of such geometries, Antonio Gaudí and Henry Moore, if this is where they learned their craft. The entire northern part of the island is made of stone, and if you try to leave none of it unturned in your efforts to see what there is to see, you will be there a very long time indeed. 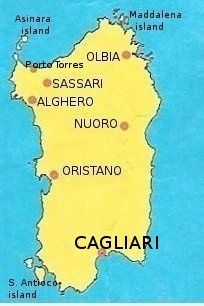 The first settlers of Sardinia started piecing together their fortress homes, called nuraghi, about 1500 b.c. They had various rooms and floors, corridors, cells, internal staircases, even parapets, for they were true miniature castles, built to dominate the surrounding countryside. Architecturally, there are similarities to structures of the ancient Mycenaean civilization on Crete, leading some scholars to believe that these original Sardinian stonemasons came from that part of the Mediterranean. The remains of dozens of these nuraghi are still found throughout the island, primarily in the north. Along with their castles, the builders also left various other bits of stone standing around, single freestanding ceremonial monuments, as well as tombs, ranging from small single-chambered crypts to enormous slabs marking the final resting place of a number of persons. One of the most impressive of this latter sort is the so-called Tomb of the Giants outside the northern town of Arzachena. From the 8th century b.c. to the coming of the Romans, the island was in the hands of the Phoenicians and the Carthaginians, who introduced large-scale agriculture and fishing, and divided the island into administrative districts. When their turn came, the Romans did their usual thorough job of organization, leaving a network of roads which modern streets and highways still follow in part. Sardinia was a vital role in the strategies of Roman navies during seven centuries of rule. Then, with the fall of the Western Roman Empire, Sardinia became a province in the "African Prefect" of the Byzantine Empire. In the 9th and 10th centuries Sardinia had a try at going it alone. The island was divided into "judgeships" (giudicati), autonomous units ruled by an hereditary patriarch or "judge". There existed side by side the idea of private property and collective land set aside for cultivation by the poorer classes. In modern terms, it might be said to have been sort of an experiment with "agrarian democracy". It is a period which lasted for about two hundred years and one which still fascinates scholars. In the 11th century, Arab incursions of the island were finally repelled, but only with the help of the two powerful maritime republics, Pisa and Genova. Pisa, thus, took over Sardinia and ruled until the coming of the Aragonese in the 14th century, and then —after the fusion of Aragon and Castille— the Spanish Empire in the 16th century. With the decline of the Spanish, the island passed briefly into the hands of the Hapsburgs and then in 1720 to the House of Savoy (the future royal family of united Italy). For the next 75 years, the island was a separate kingdom with Savoy monarchs. It was not a particularly good time for the island and led to a brief flirtation with republicanism in 1802 in the wake of the Napoleonic fever gripping Europe. (That period included the presence of Admiral Horatio Nelson in Sardinia, specifically at La Maddalelna in the north (see this link). In 1847 the island was incorporated into the Savoy kingdom of Piedmont and its history then joins that of Italy as a whole. Italy's wholeness has much to do with the activities of her great patriotic hero, Giuseppe Garibaldi, who was rewarded by the new rulers of united Italy with an island for his very own. It is Caprera, joined by bridge to the island of Maddalena off the northern tip of Sardinia. Garibaldi's tomb is on Caprera, and his home there is now a museum that may be visited. Tourism is one of the most important industries on Sardinia these days. The northern part of the island boasts the second largest city, Sassari, site of one of the most spectacular folk festivals in the Mediterranean, the so-called 'Cavalcata Sarda'. Held on the next-to-last Sunday in May, it is a morning procession of hundreds of costumed participants, many on horseback, from around the island, followed by an evening of dance and song. The northeastern part of the island boasts the famous Costa Smeralda, site of Porto Cervo and its yacht clubs of the stars. The same area is now witnessing a blossoming of time-sharing condos for the less rich and famous. There are some unconventional ways to be a tourist if you so decide. You might consider agritourism which has been catching on all over Italy recently. This means that instead of plopping yourself down in some hotel or other, you become the guest of working farmers. You, luckily, don't have to work. You pay for room and board with the family and then do what you like. The word is out that it is good traditional fare among friendly people at a reasonable price. The agritourist organization for Sardinia is the Cooperativa allevatrici sarde, located at Via Giotto 4, 09170 Oristano; tel: 0783/78670. Also, much of Sardinia is ideal for hiking and expeditions on horseback, details on which may be had from Sardinia Internal Travel, Porto Cervo, tel. (0789) 92225, as well as from the Centro Turismo Equestre e Agriturismo Ogliastra, S. Maria Navarrese, tel. (0782) 615110. The northern Sardinian port of Olbia is easily reached by overnight ferry from Civitavecchia. There are sailings, as well, from Naples to Cagliari at the southern tip of the island.